Pare and boil till done; drain, and mash smooth; add milk or cream, and salt; beat like cake, with a large spoon--the more they are beaten the better they become. Put in a baking dish; smooth with a knife dipped in milk; place a lump of butter in the center; sprinkle with pepper, and place in a hot oven for a few minutes. Pare, and cut in halves. Have in a skillet some hot fryings, in which place potatoes; pour in about one-half pint of water; season with salt and pepper. Cook until tender. Remove the cover, and let brown; take out in dish; throw a spoonful of sugar into skillet, with a little flour and water; let boil up once or twice, and pour over the potatoes. 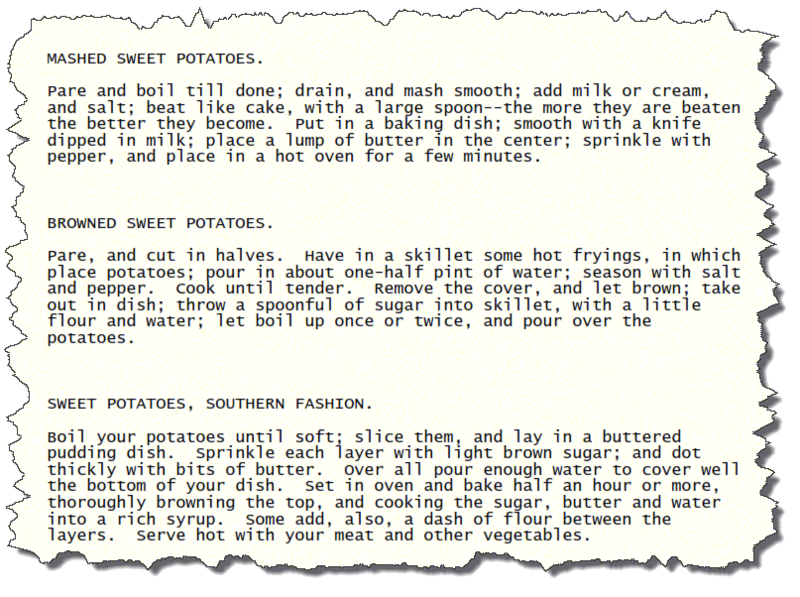 Boil your potatoes until soft; slice them, and lay in a buttered pudding dish. Sprinkle each layer with light brown sugar; and dot thickly with bits of butter. Over all pour enough water to cover well the bottom of your dish. Set in oven and bake half an hour or more, thoroughly browning the top, and cooking the sugar, butter and water into a rich syrup. Some add, also, a dash of flour between the layers. Serve hot with your meat and other vegetables.